The London Borough of Lambeth is a very diverse community, with an estimated 1 in 6 residents across this Borough speaking Portuguese as their native tongue. Following an annual report compiled by healthcare leaders in Lambeth and the completion of Lambeth Council’s Borough Plan, it has been identified that the Portuguese speaking community is at risk of health and social inequalities, leading to poorer health outcomes for this group. Working on a programme to address these barriers to healthcare, since 2015 a small project team of Healthcare professionals, Education experts and Portuguese charities, led by Lambeth GP Dr Vikesh Sharma, have been making progress on an exciting and innovative project, with an ultimate aim of leading to a reduction of healthcare inequalities across the London borough. From already delivering results across the past year, this group are now moving into the next steps of this exciting project, broadening out to form a larger working group of key members who have expertise, insight and influence within the healthcare sector, the Portuguese community and in language, education and culture. Above all, this group share a passion for wanting to work together to support the health and wellbeing of the Portuguese community in Lambeth. It’s just before 3pm (the session kick-off time) and attendees have started arriving. “There are around 20 people coming altogether”. It’s great to see so many people gathering together to commonly address a community issue that is close to their hearts. Looking across the room, the chairs and tables are filled with key project stakeholders - the group working together towards improving healthcare in Lambeth and revolutionising inequalities within healthcare for the Portuguese community across the borough. Introducing the workshop is Will Nicholson - Connector and Independent Facilitator at the Health Foundry. Will creates the magic in getting the right people in the same room together at the right time. He’s the catalyst behind this afternoon’s workshop. Aimed at the adolescent and young population - how can we support their educational needs? How can we improve their career opportunities? How can we inform them about better health for themselves and also their family? LCN (Local Care Network) focus on long term conditions and chronic disease. How do we help members of the community make the right choices when to access help? Where do they get this help from? How do we provide a platform to encourage self-help and community support? How do we engage with the most vulnerable and isolated members of the community? How do we identify their issues, may they be mental health, socioeconomic, housing, etc.? Hour one already down. Time is flying. Quickly onto the next task in the workshop - it’s time to begin forming our user personas. “A user persona is a representation of the goals and behaviour of a hypothesised group of users. So these are the individuals within the community who you speak with and encounter on a day-to-day basis”, explains Leon. Name and age - Who is this person? Their background - Do they have a job? What is their family background? Do they have access to the internet? Pain points - What are their needs? Do they have any concerns? So we now know Maria, and have drilled down into some of her current pain points. She works unsociable hours. She’s lowly paid. She experiences low moods and depression. With Maria identified and firmly on our radar, it’s time to broaden out to identify other personas from within the community. We’re now beginning to form more and more potential faces of people within Lambeth’s wider community, directly from people they engage with on a close basis. 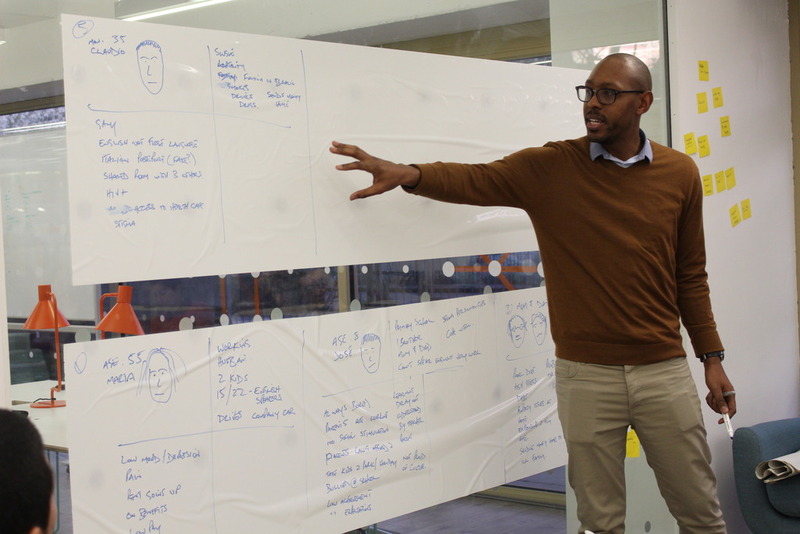 With the wall now filled with our personas, it’s time to identify one to bring forward into the next stage - journey mapping. We’ve only got one hour left, so it’s time to get our heads together and come up with some ideas based on what we’ve been discussing. “Break out into three groups. Look at José’s user persona. Address his user journey and identify the opportunities for intervention within this journey. Then come up with ideas around how we can support him”, instructs Leon. “Ask yourself the question: ‘Where can we make the biggest difference in the shortest amount of time?’”, follows Will. “We understand how he lives day-to-day. We understand there’s a chance of him being bullied or slipping into bad habits. What can we do to support him in the community to ensure this doesn’t happen?”, adds Leon. Supports networks, social groups, breakfast clubs, social media - each group is now getting into their element and the idea discussions are flowing. After half an hour of batting around thoughts and ideas amongst ourselves, it’s time to share these across the wider group with a Show & Tell, the final session of the afternoon. Each group has nominated a spokesperson to stand up and take the group through the initial ideas they’ve come up with. Ideas are ranging from a breakfast homework club to sessions to increase awareness of dietary/illness issues, with a Portuguese interpreter present. With the Show & Tell session wrapped up, the clock has struck 6pm and we’ve come to the end of this workshop. Although the afternoon may be over, the passion to move these ideas forward is just beginning. Our next steps are to begin testing these initial ideas within the community to validate what will work and what might not. We’re beginning to form an informal leadership group to start to take ownership of driving forward these ideas. Watch this space…! See more about what’s been happening across the project here. (Also, a huge thank you to the brilliant team at the Health Foundry for the fantastic session photos). We’re looking to run a 5-day product accelerator later in the year within public and private sector healthcare at the Health Foundry. If you have an idea for a product that you think can help patients or transform how your NHS department works, email graeme.mccubbin@unboxed.co to register your interest.